STAMFORD — Looking around the Trinity Catholic gymnasium, you cannot miss the banners on the walls marking the past glories of the boys basketball program. Seven state championships, six FCIAC championships and the retired numbers of former greats adorn the walls of the tiny old gym. Mike Walsh cherishes each uniquely and can tell you, in detail, about how each title was won, beginning with the first FCIAC championship in 1993 over previously unbeaten Fairfield High all the way up to the Class S state championship claimed in 2017. Walsh recalls each win fondly, of course, but more than the championships, the topic that gets Walsh excited is his former players and the bonds he has formed with many of them after they left the school. This weekend, Walsh stepped down as head coach of Trinity after 39 years. He will remain active with the team as an assistant coach, but the days of Mike Walsh as Trinity’s head basketball coach are over. Being able to stay on as an assistant was the determining factor for Walsh finally stepping down, saying that will allow him to stay around the game and kids, but still spend more time with his own grandchildren. Keeping him out of the gym at Trinity would never be possible since he has spent most of his life there, graduating from the school in 1965 and coming on as an assistant basketball coach under Gary Liberatore in 1973 before taking over as head man in 1979. His 633 wins leave him as the fourth winningest coach in Connecticut history, but Walsh said it was what happened after he announced his resignation that meant more to him than any victory. As soon as the news of his resignation was out Sunday night, Walsh’s phone started blowing up with calls and texts from former players and their parents, as well as coaches around the FCIAC. Walsh said the flood of people reaching out was overwhelming and reminded him of what the best part of the last 39 years. Walsh stayed around long enough to not have many contemporaries on the sidelines, but several of the current young FCIAC coaches texted or called Walsh after the announcement, letting him know they admired him and would miss competing against his teams. Walsh always recalled being a young coach himself and watching and learning from coaches like Herm Alswanger, Ralph King, Jim Moriarty and Lou Orlando in Stamford as well as Vito Montelli at St. Joseph, Don Usher at New Canaan and Brian Kelly at Staples. As coaches around him retired, Walsh became the elder statesman of the FCIAC, with many young coaches looking at Walsh the same way he viewed his mentors. It should be pointed out, that while Montelli and Charlie Bentley of Harding are above Walsh in the state’s all-time win list, Walsh is the only one of those three to pick up all his wins as a member of the FCIAC, making him the winningest coach in league history. 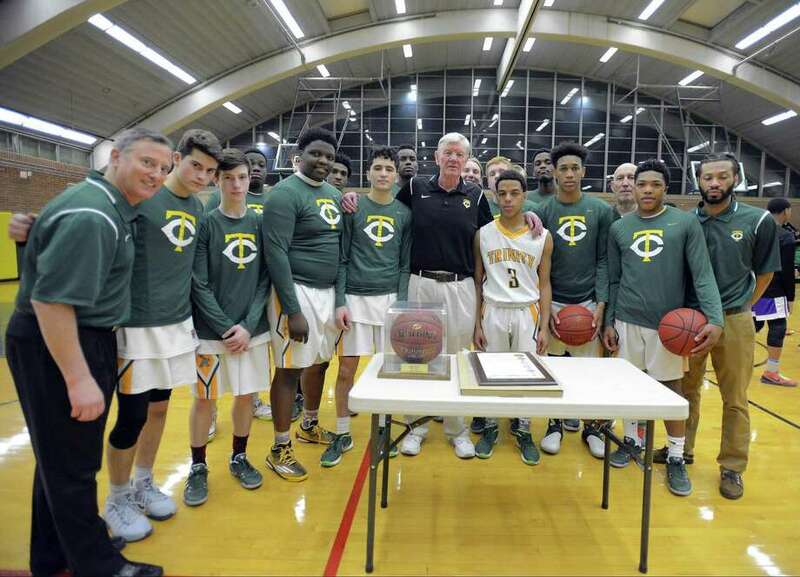 Given the current state of coaching in the age of parental interference, it is hard to imagine a current coach sticking around for 39 years or anything close to that, making 633 wins a mark that will likely never be eclipsed in the FCIAC. Walsh had some good teams early in his career with John Smyth and company, but for many years was a middle-of-the-pack team in the FCIAC prior to 1991 and the arrival of Rashamel Jones. In today’s world of helicoptering sports parents, Walsh may not have survived the lean years between Smyth and Jones where the goal was just to qualify for the state tournament. But at that time at Stamford Catholic, he was able to learn on the job and get better without the thought of being forced out or fired. The arrival of Jones on the then Stamford Catholic campus changed the landscape of CIAC and FCIAC basketball forever. Jones was followed by Johnson, Thomas, Dave McClure, Craig Austrie and other players not from Stamford coming to play at Trinity Catholic, shifting the boys basketball program from an average FCIAC team to annually one of the top programs in the state. The players came from various towns, but many of them came to Trinity via the Port Chester CYO pipeline. Recently, it was announced that Jones would be joining Walsh in the Fairfield County Sports Hall of Fame, making them one of the few coach-player combinations in the hall. Walsh says when Jones is formally inducted in November he will be at the ceremony beaming like a proud parent. But whether it is a hall of fame nomination, the birth of a child or something as mundane as a promotion at work, Walsh loves hearing about it all when it comes to his former players. Walsh has always been just as interested in his role players as his stars. When asked about the recently departed Class of 2018, Walsh rolled through the roster and who is playing where before taking a two-minute diversion to talk about Jack Soucy, who played guard on the team, averaging less than a point a game. Soucy is going to Fairfield University not as a basketball player, but as a student, yet Walsh waxed poetic about him like he was a starting guard at Duke. No doubt, Soucy will join the long list of players who stay in touch with Walsh. That is the story untold by the banners in the gym. The wins, state and county championships are counted on the walls, but it would be impossible to put the relationships Walsh has formed with hundreds of players up on a banner.